This series was created by partnering with designers and end users to develop unique and custom solutions. Many of the panel designs originated as new materials like dECOLeather, 3D Vinyl HPL, Aluminum HPL and Mirror Acrylic became available. 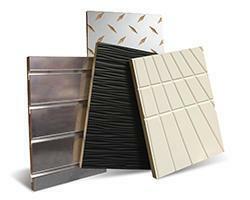 Our CNC capabilities allow for endless custom machining: Subway Tile, FOCALwall, Diamond Plate and Bull’s Eye are just a few of the possibilities that awaits.